HOW MUCH DO YOU LOVE HOUSTON? Put on your detective hat and hunt for items, answer trivia questions and get social during the Game City Love Scavenger Hunt this week. 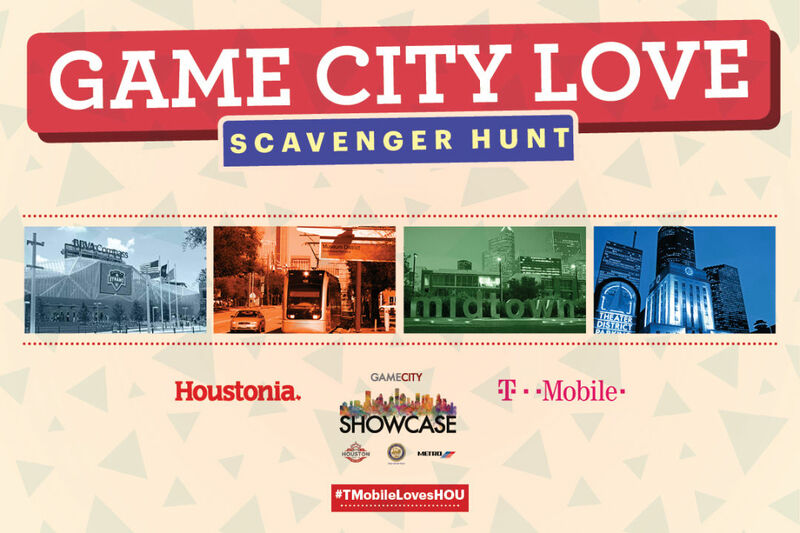 Leading up to Super Bowl 51 and brought to you by The Houston Mayor’s Office, Houston Super Bowl Host Committee, METRO and many other influencers in the city, the scavenger hunt is one of many components part of the Game City Showcase. Taking place across Midtown, Theater District, EADO, and the Museum District, the contest begins Monday, January 30 and ends Thursday, February 2. To enter, you must complete the 12-step challenge by 9 p.m. on Thursday evening. Trivia questions should be submitted below. Three lucky winners will be chosen at random and announced via Facebook Live Video on the Game City Showcase page by Monday, February 6. Don't you want a chance to win one of these awesome prizes? What are you waiting for? Get going! Trivia - The Heisman Trophy is named after John Williams Heisman, who ended his career as the head football coach at what local university? Submit answer below. Facebook Live or Video Upload - Hop on Facebook Live and tell us: 1. What your favorite neighborhood is and why 2. What you love about Houston 3. One thing we can do to make Houston better. Photo Challenge - Take a selfie in front of the traveling “I AM HOUSTON” Art Mural #tmobileloveshou and #showlovetolocal. In your post tell us which word on the wall resonates with you the most. Find the Item and fill in the blank - Find the Houstonia in a GCS featured venue* and go to page 41. The man in the photo is Joe Turner - which project that occurs at Sylvester Turner Park is close to Joe's heart? (Hint: Second of its kind) Submit answer below. **Bonus, when you find the magazine ask for your Houstonia canvas tote. It's our gift to you! (While supplies last). Google Search & Facebook Post on Personal Page - Conduct an internet search for sculptures and murals in EaDo, Theater District, Museum District or Midtown. Post your favorite sculpture and your favorite mural to your Facebook #tmobileloveshou #htownshowcase, check in to its location and share why you like it so much. Trivia - Which of the following products was not invented in Houston. Seedeater, condensed milk, silicone breast implants, astro turf? Submit answer below. Find the Items - Go to Hard Rock Cafe in the Theater District and find the picture of ZZ Top before they had beards. Check in, #TMobileLovesHOU and post the photo the GCS Facebook page. Photo with a Stranger - Find a Shipley Donut Store in your neighborhood and take a picture with a customer eating and list your favorite donut. Check in, #TMobileLovesHOU and post the photo the GCS Facebook page. Photo Challenge - Take a picture with a T-Mobile rep, with an iPhone 7 or any tablet, use scavenger hunt hashtags, tag yourself and posting to the Game City Showcase Facebook Page OR visit a T-Mobile Samsung booth at the GCS! Click here for a list of T-Mobile stores in the area. Post - Visit htownshowcase.com, select the event you think is the coolest. Head there and take a picture. Food Sample - Select one of the restaurants participating in Houstonia's Football Food Crawl and get your food and beverage sample. Rate your dish 1-5 and tell us about your experience. * GCS featured venues, where magazine can be found: Monday @ Midtown Art Crawl; Tuesday @ Little Napoli & Wine Cellar; Wednesday @ 8th Wonder Wonderworld; Thursday @ Asia Society of Texas.